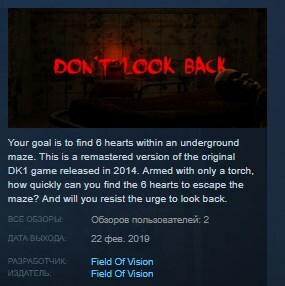 In this VR horror game your goal is to find 6 hearts within an underground maze. This is a re-mastered version of the original DK1 game released in 2014. Armed with only a torch, how quickly can you find the 6 hearts to escape the maze? And will you resist the urge to look back. The core additions in this re-mastered edition are the use of the touch controllers, new lurking enemies and a leaderboard to see how fast you can complete the maze.